Lucifer's Feather is a fossilized feather that was excavated from one of Lucifer's many crypts by an unknown seller. The fossilized feather was then sold to a young man named Adam, who used it in a Satanist-Society-of-America-approved summoning. 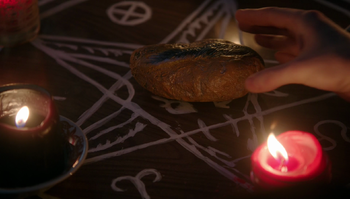 While the summoning itself was fake, the feather proved enough for Lucifer to appear in Adam's basement. Lucifer swiftly snaps the neck of Adam's friend, Gordy, before taking the feather and placing it on his deteriorating body, temporarily rejuvenating it. This page was last edited on 7 December 2016, at 13:39.